At Levenson Smile, patients in the Worcester, MA area who are faced with tooth loss may be unsure of the options available to them. The idea of full dentures makes many patients think about the restorations their grandparents used to have. Full dentures may bring to mind images of ill-fitting false teeth that looked nothing like the original smile. With today’s advances in dentistry, full dentures are becoming more natural looking and have a better fit than ever before. Dr. Stanley Leveson and his professionals are here to help patients in obtaining the smile they’ve always wanted with state-of-the-art full dentures. Our dentist, who provides full dentures, works closely with patients to help them determine if dentures are the most beneficial option for their smiles. Many of our patients who have lost all their teeth or are preparing for extractions will want to find out how the use of full dentures will impact their smile. Full dentures are essentially acrylic restorations that include false teeth and gums. The restorations allow patients to restore the functionality of their smiles for eating and speaking. Evaluation – the process of obtaining full dentures starts with an initial evaluation. Not everyone is well-suited for full dentures, so during the initial examination, our professionals will take x-rays and provide a physical evaluation to see if other options such as partial dentures can be used. Full dentures are only used in situations in which the patient has no teeth along the dental arch. This may be due to tooth loss or extractions. 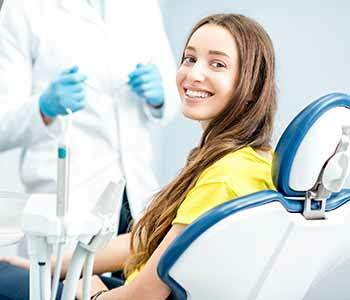 Extractions – some patients with just a few teeth may choose to have the teeth remaining in the dental arch extracted. This is to prepare the smile for the fabrication and placement of the full dentures. This may be better than using large partial dentures to replace more than half the teeth along the dental arch. Impressions – once the area is prepared, a series of impressions is taken. These impressions are molds of the gums, which are then used to create the dentures. The fabrication of the new smile is done with the help of the patient. Patients work alongside our dentist to design their new teeth in size, shape, and color. Fabrication – the impressions are then sent to an outside dental laboratory with specific design instructions from the dentist. The impressions are used to ensure that the new dentures fit in the smile precisely for optimum function. Placement – once the dentures are completed by the dental laboratory, they are sent to the dental office. Patients come in for another appointment during which they are fitted with their dentures. Patients take this time to learn about how to place and remove their dentures, clean them, and how to care for them so that they will last as long as possible. Most patients need some time to adjust to their dentures. If patients are using dental adhesives to secure their dentures in place, they are educated on how to use the adhesives properly. WHO IS A CANDIDATE FOR FULL DENTURES? Any patient who has lost all the teeth within the dental arch or wants to undergo extractions to prepare their smile for full dentures, will be considered an appropriate candidate. During an evaluation with Dr. Stanley Levenson, patients can learn about alternative options that they may be able to use, depending on their unique situation. Sometimes, patients may be able to enjoy bridges or implants, or even use dental implants along with their full dentures for optimum stability and strength. We encourage patients to take the time to educate themselves on the ways in which they can repair their smiles after tooth loss. Dr. Stanley Levenson of Levenson Smile is a dentist in Worcester, MA who is dedicated to helping patients achieve the smiles of their dreams. If tooth loss has impacted the function and appearance of your smile, we encourage you to book a consultation appointment with our professionals to learn about the advantages of full dentures. Call the office at (855) 849-8255 to schedule your visit, and attend your appointment at our practice, conveniently located at 9 Linden Street.